Hide product prices and "Add to cart" button for specific products or whole categories. Manage prices display depending on customer groups. Customize button texts and messages to make your pricing policy maximally flexible. A well thought out pricing policy ensures high conversions and customer loyalty. If you are looking for a tool to easily manage price display on product and category pages, the Hide Price extension for Magento 2 is exactly what you need. The module lets you hide prices of specific products for particular customer groups or guest visitors. Apart from that, you can remove or replace the 'Add to cart' option with a custom button to encourage customers specify their contact info or perform the action you need. This way you'll demonstrate a personal approach to each customer and effectively adjust prices to your business needs. With the extension an admin user can easily hide prices on specific product pages as well as for whole categories. Due to flexible settings it's possible to effectively regulate prices visibility depending on your business goals. With the Hide Price extension for Magento 2 you can not only remove the 'Add to Cart' button, but to replace it with any custom one. 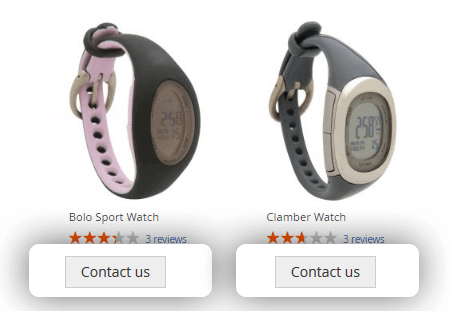 Specify your own button texts to motivate customers share their contact info and provide you with additional order requirements like product material, size etc. A handy pop-up window appears once a visitor clicks on the custom button which is used instead of 'Add to cart'. It's specially developed to help store admins quickly collect customers' data. Therefore, you'll easily tailor prices to any specific requirements by contacting each customer directly and generate a rich client database for your marketing activities. 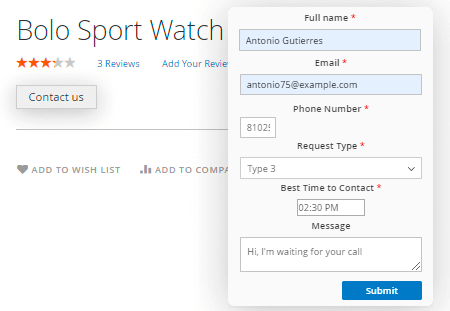 Effectively collect additional customer request info by adjusting Custom Form extension. This option will help you to create quote request forms of various types. For example, you can add the zip code, company name or any other field, adjust Google Maps element or use fields dependency for the 'Call for price' pop-up. Therefore, you'll enrich your client database and obtain more information to create personalized offerings for your customers. Link custom buttons to any page to display necessary information to store visitors. For example, you can change the 'Add to Cart' text to 'Register to see the price' and redirect shoppers to the registration page or you can inform customers that particular products are available only for VIP customers and redirect shoppers to the 'Learn more' page. Display or hide product prices based on customer groups to let each user see only relevant content. This way you'll easily generate special offers for wholesalers or retailers and hide important selling information from others. Due to this handy option you'll be automatically notified about each new quote request via email. Therefore, you'll significantly reduce the average response time and boost clients' satisfaction. To effectively process 'Get a Quote' requests you can view the details of each request on a separate page and instantly reply to them via email right from this page. 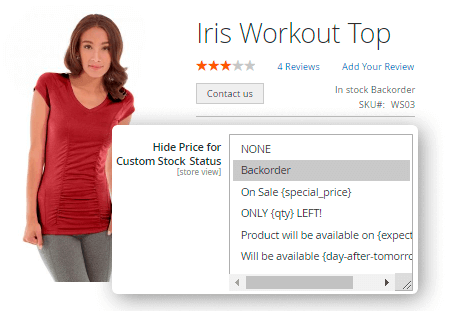 Due to the synergetic work with the Magento 2 Custom Stock Status extension, you can hide prices for products with specified stock statuses in one click. With Magento 2 Custom Stock Status, assign stock statuses to products. With the Hide Price extension, choose the stock statuses you want to hide prices for. As a result, the price will be hidden for all products of a defined stock status automatically. The extension offers a handy feature that will help you to collect users' consent on the usage of their data. You can enable a checkbox for opt-in consent with a description of how are you going to use their personal data. Employ Custom Form for Magento 2 to create custom quote request forms of various types, specifying additional information you need to generate a special price offering. I have installed this extension on my Magento 2.2 and it works exactly as described. It has rather good number of features. Thanks a lot! I have reviewed several similar extensions and have found this one is the best! The superior feature list. Known good support and free lifetime updates. Thanks. – Export issue was fixed. – Amasty Invisible Captcha compatibility improved.